Just as I was about to hit the publish button it, I lost all my work. Yelp, almost an hour’s worth of writing gone down the drain. Vanished into the abyss of all great lost documents, never to be seen again. I should know by now how important it is to save your work…..often, but I still take the risk. And my computer sometimes wins. Oh well. That’s how it goes. I will quickly say I enjoy watching Noah grow and develop. 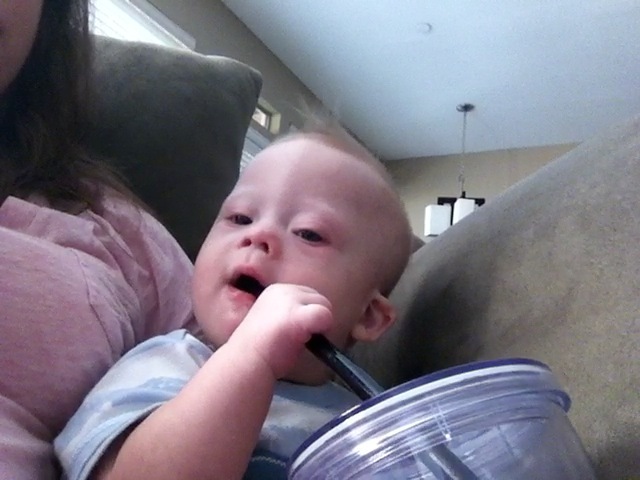 Like today for instance, he had no idea what a straw was, but he keep going, kept pushing forward, until he figured it out. I like that. There are lessons to be learned by watching how a child interacts with his world. Lessons we as adults must learn (or at least re-learn.) Lessons I’m to tired to retype tonight…. 🙂 But I’m sure I’ll come back to it in another post. Or just as frustrating…when you are trying to download something and you get to 98 or 99% and then the computer shuts down. WHAT?! WHY?! Just take a deep breath and go on…. LOL! Thanks! I totally agree. Can you imagine how hard it is to get anything done around this house with that cute little face always around smiling? I am a volunteer librarian for my boys’ school. DH and I have bought all the books ourselves, so the kids have them. I decided rather than buy three of the same book, I would catalog all the books. And I didn’t save it to a disk, and my computer crashed and I lost it all. ALL. 3,500 books or more. I then used DH’s macbook and a new program to catalog books. And we were getting ready to save it to disk, and online, and yes, it crashed, again. I’m about to get out a card catalog index, seriously! Oh no….so sorry to hear that! That’s so nice of you to help out like that. You children’s school is lucky to have an awesome volunteer like you! By the way, the card catalog reminded me of the dewey decimal system…! I remember actually having to go manually look up books when I was in high school! Wow…..
By the way how old is Josh and his siblings? well, even though you lost your writing, I think we all get what you would have said. It is so amazing to see how their little minds work. My husband was just saying to me he can’t wait for PJ to crawl just so he can see where he wants to go to and what interests him. They are amazing. And I agree about Noah’s cute little toes! I work from home, and my work computer has it in for me. At least once a year, we find out that information I have put in throughout the year has vanished into outer space. For the last 2 years, I have spent from right around Thanksgiving or early December until Christmas or New Years re-inputting information that has been lost in the cyberworld vortex/black hole. I definitely know how frustrating this is. I wouldn’t wish this on anyone…sorry it happened to you. Oh, and could Noah BE any cuter if he tried? I’m totally mesmerized by his bright eyes. Thank you for opening your lives to open so many peoples’ eyes. Oh no…! Luckily it was still on your screen though. 🙂 Won’t you be glad one day when all computers everywhere do exactly what you want them to do all the time!? I’m the opposite Rick. I’m so paranoid and hit save so often that I will write something on a piece of paper, and then want to make sure that I “save” it. The sad thing is this has happened more than once! Well, I better type as fast as I can so I don’t lose this either. HA! I think everyone knows what your heart was going to write. This is a good thing. 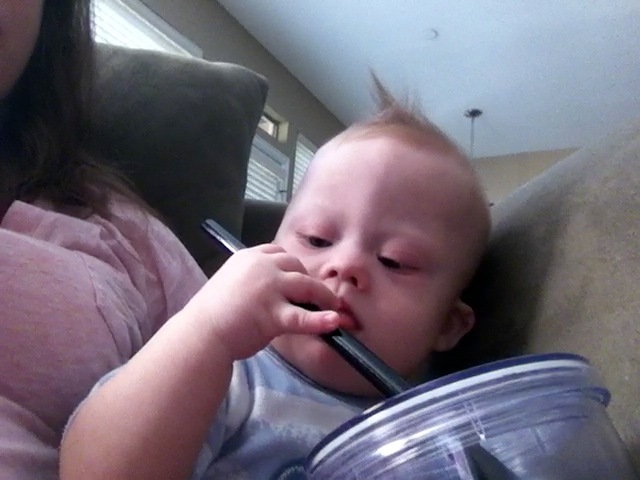 Noah, and every other child out there, regardless of special needs or not, certainly has a neat view of our world. I often wonder what Enzo is thinking at that very moment. He has such wonder in his eyes. My favorite is when he just stays at us….the love is just pouring out. It truly tugs at our hearts. It’s such a beautiful moment. 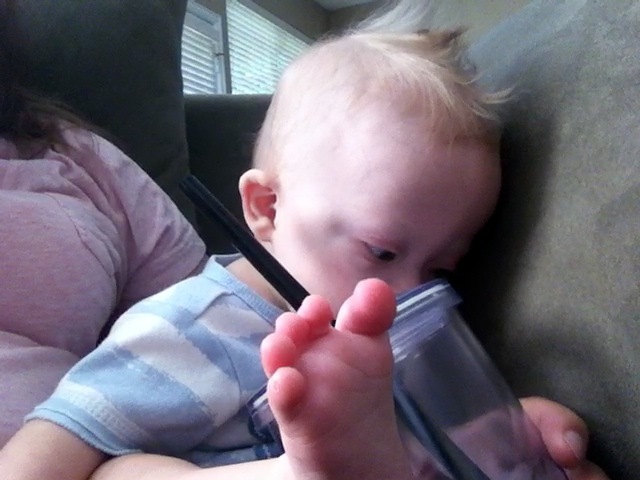 Looks like Noah really wanted to know more about that straw and what was inside the cup. I sure hope he was able to find what he was looking for! It sounds like you got my point. 🙂 It’s sad how us adults often loose sight of our sense of wonder and curiosity. It’s so important for us to continue to see life through new lenses. To keep our sense of playfulness, ask questions about the things in our life, etc…. I hope Noah, and Enzo, and all of our kids keep that about them their entire life! You guys are doing such a great job. So glad to be on this journey with you! Love the pic with the little toes in it!!! How many times a day do you kiss them! I grab Em’s til she gets mad and pushes me away. as to your question. A couple of summers ago we went camping. All was just perfect til the computer died. The motherboard! We lost EVERYTHING! All my husbands work, all our photos taxes everything! I felt like we didn’t exist anymore. Luckily the campground owner directed us to a friend who was able to save almost everything. All I cared about were my photos!! of course my husband was sweating bullets about all the other stuff that made up our lives! Scary couple of days!! My husband now backs everything up! And i got my photos back! I’m paranoid about loosing my photos / videos. You are right that is the main thing I would be concerned with loosing. I backup all of that sort of stuff to ‘the cloud’…I use an online backup program called ‘crash plan’ it’s great because it backs up everything online, and I don’t have to worry about it! I do a local backup on my mac with Time Machine, but if our house caught on fire, or someone broke in, the back up hard drive would be long gone. Backing up online makes sure those photos stay safe! It cost a few bucks a months, but the security I have knowing that all my photos / videos are secure is worth it. I’m glad you were able to get your photos back…did it cost you guys a pretty penny? Wow Libby….you are a real computer pro…!!! By the way, you really should receive a reward for being such an awesome Facebook fan that they gave you a time out! Love it. Geared more towards business lessons…but very similar stuff. @f252e9680c628566dad99cc368446324:disqus Thanks for sharing this Brian. Do you know anyone personally with Down syndrome? I love the way our kids teach us so much. In fact this has given me a topic for my blog. What I do with blogs is I write them with good ole pen and paper and then type them into the computer, usually in MS Word which periodically autosaves, then I cut and paste into my blog. I suppose I’m a bit paranoid about stuff like that, it comes from my dad who got into computers in his 60’s in the days when floppy disks were 5 1/2inches and DOS was the opporating system. Back then it was automatic to save things because of the low capacity of storage space on computers. Anyway our kids teach us so much, from the wonder of discovery, to the pure love they give, to a million other things. Mine teach me to slow down and enjoy the moment, to just be in that moment in time, with them. As always Noah is just so adorable, I would just love to play with his little baby toes and his belly and nose and just love on him. Yah, MS Word normally works well, I also really like a program on the mac called iA writer which is GREAT! It’s actually “impossible” to loose anything when using iA writer as it auto saves in real time (if you are using Mac Lion) so it’s great! And thank you for the kind words on Noah, I agree. He is a real cutie. I think I’ve maintained my sense of wonder pretty well through the years. However, I’ve noticed when Caleb stops to check out an acorn or open something that’s closed, I find myself getting irritated that we’re getting off schedule. I’m thankful for the days when we have time to explore; I’m usually the first in line! The other day I wrote a blog post on my iPad (which I’ve not had good luck with, but I wanted to use a photo on my iPad ). It posted to the wrong blog, so I took it down and reposted, but it didn’t work! By the time I realized that, my work was gone from the iPad. So I Googled my first blog and selected “Archive” from the Google options, and sure enough, there was my post, archived by Google! Copied/pasted, and all was saved. I felt like a genius. What app do you use on your iPad for writing? (And do you use an external keyboard?) Abbie and I both have iPad 2’s but mostly just use them to browse the internet, use Facebook, etc….. I’m not sure if you have ever heard of iA Writer, but it seriously one of the most awesome apps ever. The app autosaves in real time, syncs between mac and iPad, and is an all around awesome writing app. You should check it out. And you seem like the creative type (I think you mentioned you were a designer, right?) which means you probably like to take time out to have fun! I totally get what you are saying about getting off schedule. Noah’s young now so we don’t deal with to much stopping and looking at acorns, but I can imagine how important it will be as he gets older to learn to let my schedule flex sometimes….it’s easy now that he’s a ‘baby’….also, we only have one little one (for now) and I’m sure having more than one is a different ball game! By the way, how many children do you guys have? If I’m reading your avatar right, it looks like 2? I don’t do a whole lot of writing on my iPad, so no keyboard. The blog posts were using the Blogger app, which I do not recommend. It could be so much better! Thanks for the iA Writer app recommendation. Looks like it may be handy for whenever I write my memoirs. 😉 I use my iPad for the same as you, but I also use it as my mobile portfolio, and take it to clients to show them their images and make orders. We have two kids: Caleb, 3 yrs, and James, 17 mos. They’re the coolest kids on the planet. 🙂 Two is definitely a different ball game, but it’s a fun one. @63107f486a6353ba697879e97c0e9534:disqus Awesome stuff! I really like your photography work!